Imagine its December 2, 1863, and you’re standing in the cold. Surrounding you are the governor of the Nebraska Territory, Alvin Saunders, and the mayor of Omaha, Benjamin Eli Barnet Kennedy. Council Bluffs’ mayor is there, along with a Judge Larimer and Judge Lake. Luminaries from Omaha’s pioneer era stand around, too, including A. J. Poppleton, Augustus Kountze, Ed Creighton, John I. Redick, General Experience Estabrook, J. J. Brown, and George Francis Train. Locally renowned leader A. J. Hanscom was leading the show. These are maps of the North Omaha Bottoms in 1873, 1891 and 1923. Everyone’s come here to break ground on the much-hyped and hotly anticipated Union Pacific railroad, which will provide the first transcontinental railroad in the U.S. Instead of plodding along in wagons, gaggles of Easterners dream of riding these new rails to the riches of the West, setting up shops along the way and helping expand the American empire in wholly new ways. They aren’t thinking about the American Indians whose land was stolen, or the coming border wars with Spain, Mexico, and even Great Britain. Now imagine you’re all standing in Carter Lake, at the end south of Locust that doesn’t exist anymore. That’s where the groundbreaking for the transcontinental railroad happened on that cold day in 1863. All of this happened in an area referred to as the North Omaha Bottoms. This is a 1912 pic of the Robert Slaughter Coffee House in the North Omaha Bottoms in 1912. These are the Union Pacific Railroad Shops in Omaha, just south of the North Omaha Bottoms. This pic is probably from the 1870s. The Union Pacific opened their maintenance shops just south of the bottoms, and the North Omaha Yards were opened immediately to the west. The rail yards had thousands of cars coming in and out for more than a dozen carriers every day. The Webster Street Station brought passengers and freight in and out of North Omaha, and McKean made fancy railcars in the area for a while. With surging numbers of trains coming in and out of the area, it only made sense to serve them. The C.G. Johnson Boiler Company was at 1445 North 11th Street in the North Omaha Bottoms. That led to a number of hotels, cafes and more built up in the area, along with light industrial factories, warehouses and more. There was philandering and crime of all kinds, including the work of “Sleepy” Leon Hewett, also called the Hustler of the North Omaha Bottoms. In the 1890s, he was regularly dragged into the Omaha Police Department at 11th and Dodge, accused of burglary and more, but rarely found guilty. In 1917, the City of Omaha planned for the development of North 9th Street to become the through fare for the bottoms. Today, there are streets throughout the area, but not all of it. Some are cut off by railroads while others mysteriously dead-end for no reason. Streets in the bottoms include North 13th, North 11th, North 5th, Locust, Ave H East, Grace, Clark, Seward and Nicholas. North 11th Street is the only north-south thru street; there isn’t an east-west thru street in the middle of the area, only on the north and south edges. The boundaries of the North Omaha Bottoms were the cliffs east of N. 14th, Nicholas Street, Locust Street and the Missouri River. The bottoms were a hotly debated slate of land, especially towards East Omaha and present-day Carter Lake. The land was alternately claimed by Iowa and claimed by Nebraska, and constant battling led to stunted development. Industries didn’t want to build on land they weren’t sure if they owned, and residential developers discouraged housing to get built there. All this led to compromised situations. This is a pic of a child in the North Omaha Bottoms in 1906. The caption says, “She never heard of Santa Claus.” There are more pics at the end of this article. Starting early on, the North Omaha Bottoms were a place for paupers, the poor and the destitute to live. Bordering Granny Weatherford’s infamous Squatter’s Row, the bottoms had a lot of shacks, and according to newspaper accounts dating from the 1890s, people there lived in squalor at best. In December 1906, the Omaha Bee ran an expose called “Christmas Never Comes to the North Omaha Bottoms.” Featuring pictures of “hovels” made of scrap lumber and canvas tent villages, it highlighted the rough living conditions and destitute mothers, children and old people who lived there. Stagnant pools of water, railroads running in front of doorways and constant fighting were made to seem ubiquitous in the bottoms, and the writer recorded their findings without much hyperbole. This is a pic of from the North Omaha Bottoms in 1906. It shows a shack, and the caption says, “Typical hovel in North Bottoms.” There are more pics at the end of this article. The kids in the bottoms went to three schools: Lake, Sherman and Cass. Visiting nurses often came, and teachers at school collected clothing for their students occasionally. “Rummage sales go far,” said the paper, and the East Omaha dump wasn’t too far away. There were regular squabbles, fights, battles and wars in the bottoms, too. In one instance, George Green fought with J. F. Martin for years. Their feud apparently started over land disputes in the bottoms, and didn’t end until they died. Exchanging fists and gunfire when they were young, the pair took each other to court repeatedly in their old age. People living in the bottoms were regularly “compelled to leave,” either by the sheriff, floods or other outside forces. Eventually, their homes were all destroyed and either replaced by industrial sites, or simply left cleared by the railroads. Before the turn of the century, a so-called war broke out between residents in the bottoms and the Union Pacific Railroad. Apparently, by 1901 the UP had put up a fence on either side of Grace Street, which crossed the North Omaha Yards. The Detroit Syndicate joined in the complaint, reaching out to the City of Omaha because Grace Street was the most direct route to its land. The City replied that it would open a new street, and apparently never did. The water wasn’t allowed to stay. In 1893, the most expensive cash-only sale of land in Omaha to that point happened in the North Omaha Bottoms. The Omaha Ferry Company, left over from the 1854 corporation that speculated and sold pioneer Omaha, still held title to 180 acres of land northwest of the Winspear Triangle, and south of Locust Street. Frank Murphy ( -1904) was the millionaire president of the Omaha Street Railway Company, and a brother-in-law to Tom Cuming, the first governor of the Nebraska Territory. Charles B. Rustin (1836-1900) was a businessman and politician who made a fortune with the American Smelting Company. William W. Lowe (1836-1898) was a military leader and scion of a highly influential pioneer family in Omaha. That same year, the Omaha Bridge and Terminal Company bought land in the North Omaha Bottoms, too, buying 100 acres from Nicholas to Locust for $670,000. This was supposedly the largest real estate deal of any kind ever made in Omaha up to that year. In 1893, more than $1,000,000 in land deals happened in the North Omaha Bottoms. All of this was in speculation for the development of the East Omaha Bridge, an ambitious plan to create an industrial area in East Omaha, through the North Omaha Bottoms, and connected to the Nicholas Street Historic District and Cuming Street. Others got in on the land grab, including the Union Pacific and Illinois Central railroads. While it eventually panned out, originally the development of the bottoms took a long time, ranging from the 1880s through the 1960s. Even today, as some of the area is redeveloped, the rest is simply an industrial wasteland. Stacks of half-demolished cars compete with rusty chainlink fences and factories covered in corrugated steel with old tin roofs. Change has been a long time coming. One tract of land changed more quickly than all the rest of the North Omaha Bottoms, though. It was called the Winspear Triangle. The Winspear Triangle was a speculation area that first gained the attention of the Illinois Central Railroad when they were considering building a railroad bridge north of the Union Pacific Bridge in downtown Omaha. Securing the land, the City of Omaha claimed it quickly after in a process similar to eminent domain today. They said that since it was north of the city waterworks on the river at Burt Street, they should own the land. Afterwards, the land sat idle for a long time.In the meantime, homeless encampments, animal carcasses, and many other signs of neglect gathered. It was the focus of many real estate schemes by the City of Omaha, but didn’t develop in earnest until the 1990s, when the Gallup organization built a massive campus there. This is a pic of the North Omaha Bottoms in 1906. The caption says, “Stagnant pools a menace.” There are more pics at the end of this article. Remember there were no levies, dams or other flood control measures on the Missouri River from the settling of Omaha in 1854 through the 1910s. Building any significant construction in the North Omaha Bottoms was a bit dumb. However, this is where the brilliant leaders of early Omaha decided to start their construction on their grandiose transcontinental railroad. It wasn’t long before floods started pouring into the Bottoms on a regular basis. The most powerful came in 1881, and demolished almost all the infrastructure there, including the site of the groundbreaking for the railroad. Before and after that though, the North Omaha Bottoms were an early industrial center for the whole city. The slums in the North Omaha Bottoms were regularly flooded, and the pools of stagnant water left behind were seen as part of the hazards of living there. The bottoms cleared out over the decades, and today there is nothing left to mark what it was. This is the Presto-Lite factory at 11th and Ave H Street in the North Omaha bottoms in 1953. You can still go visit the area today, and see some of the historical buildings that helped Omaha grow into a successful city. However, the North Omaha Bottoms have lost their identity as a single area. There’s no sign of the historical significance there, either – not a plaque, sign or statue to remind everyone how the West was won, starting in North Omaha. Fuchs Machinery and Supply Company, 2401 North 11th Street – Built in 1953, standing today. This is a pic of from the North Omaha Bottoms in 1906. It shows a row of shacks along the railroad tracks at the foot of the cliff east of N. 14th Street. This is a pic of from the North Omaha Bottoms in 1906. It shows a shack above the railroad tracks east of N. 14th Street. This is a pic of from the North Omaha Bottoms in 1906. It shows a canvas tent. This is a pic of from the North Omaha Bottoms in 1906. It shows a shack by the cliffs east of N. 14th Street. This is Omaha’s North Yard in 1951. Located between Cuming and Locust between North 8th and North 14th, it was packed with railroad-related shops, spots and more. This is in the area that was called the North Omaha Bottoms. This is the Missouri Pacific Lines Yard Office at North 15th and Grace Streets. This is in the area that was called the North Omaha Bottoms. This is a 1953 pic of the Fuchs Machinery and Supply Company at 2401 North 11th Street in the North Omaha Bottoms. The building in the foreground stands today. This is a then-and-now comparison of N. 11th and Grace Streets in the North Omaha Bottoms in 1942 and 2016. These images are from Squatter’s Row in the 1930s. My family relocated to North Omaha in 1954, from Arkansas many of our family moved to north Omaha,at that time and many moved there before my mother and father. 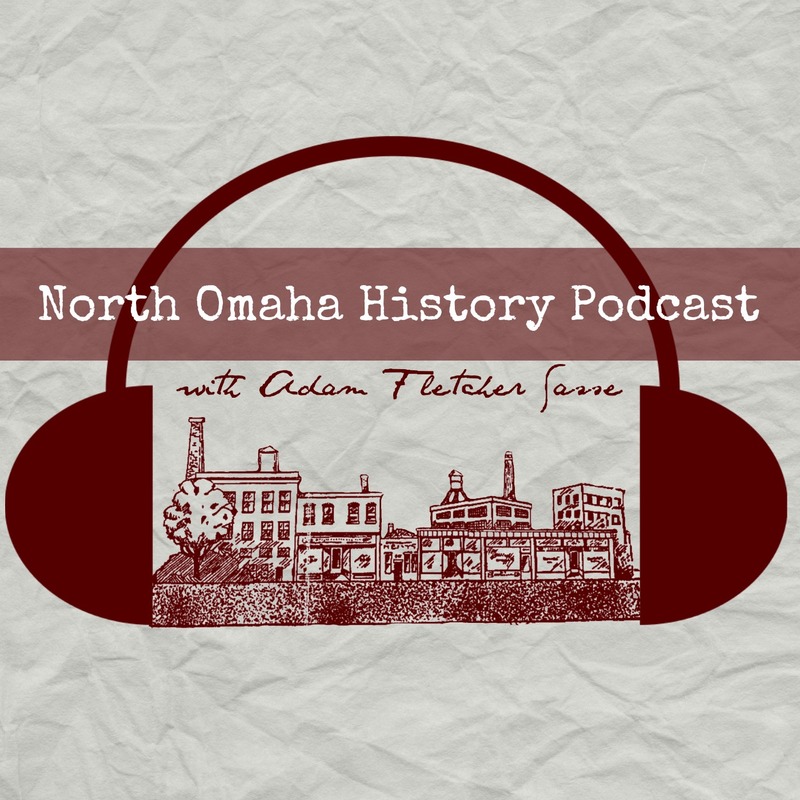 Click this pic to listen to the North Omaha History Podcast! NorthOmahaHistory.com is a personal project to research, write and share the people, places and events that made North Omaha, Nebraska a great place. To learn more, contact me! All content © 2019 Adam Fletcher Sasse. All rights reserved. North Omaha History, A WordPress.com Website.